Choosing an entrance for your home is an important decision. UPVC Panel Door range is designed to provide enhanced security, weather performance and energy efficiency, as well as creating a stunning gateway to your home. With a vast range of styles and decorative finishes available, UPVC Panel Doors complement any house type. UPVC Panel Doors are designed for optimum performance. Manufactured using the toughest and most durable materials, Inliten doors are guaranteed to retain their shape and form, will not rot or warp, and require only the minimal amount of maintenance. frame further increases the energy performance. As a result, all Inliten Panel Doors come with an ‘A’ • DESIGNED FOR MAXIMUM energy rating as standard. 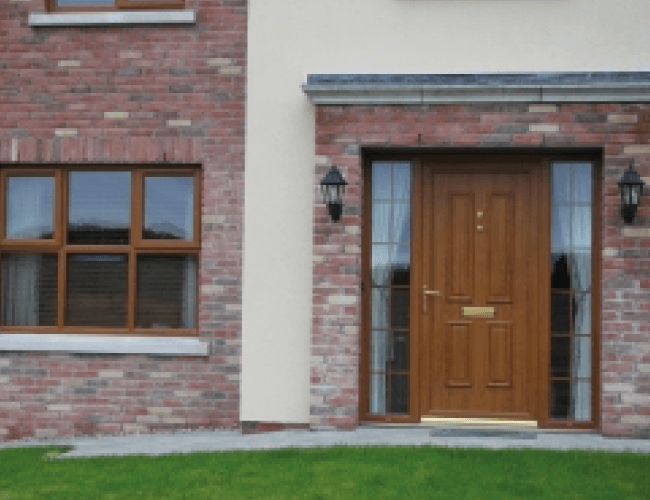 Constructed from tough, durable PVCu outer-skins, rigid Styrofoam and layers of solid MDF, UPVC Panel Doors offer outstanding levels of strength and impact-resistance. Designed for maximum security, high performance, advanced multi-point locking systems are fitted to all Inliten doors as standard to ensure your home is kept safe and secure. Choose from our wide range of panel colours and finishes, from a traditional grain-effect, foiled oak finish to a more contemporary charcoal finish. Alternatively, you can personalise your door by choosing a sleek spray painted finish to the RAL colour of your choice. Door frames are available to match any RAL colour selection.